Mimmo Rotella was born on October 7, 1918, in Catanzaro, Italy. He studied art at the Accademia di Belle Arti in Naples, and moved to Rome in 1945. After his figurative beginnings, he developed an abstract and geometrical style. As an alternative form of expression, he invented “epistaltic” poetry in 1949, a combination of words (sometimes invented), sounds, and onomatopoeic reiteration. In 1951 he held his first solo exhibition at the Galleria Chiurazzi in Rome. In the same year he won a Fulbright Foundation scholarship and was therefore able to travel to the U.S., where he studied at Kansas City University. During his time there he created a mural composition, showed at the Nelson Gallery of Kansas City, and held a performance of phonetic poetry at Harvard University in Boston. Rotella moved back to Rome in 1953, and after overcoming a crisis in his life, he produced his first Décollages. In these works he glued onto canvas parts of advertisements that he had ripped off city walls. With these initial pieces he pursued his investigation into abstract art. After 1958, however, he devoted himself to figurative Décollage and created the Cinecittà series, using figures and faces from film posters. Marilyn Monroe became one of the icons of his work. In 1961 he accepted the art critic Pierre Restany’s invitation to become part of the Noveau Réalisme movement, and three years later he moved to Paris. There he developed a process called “Mec-Art” in which by projecting negative images on an emulsion covered canvas, he created work which was shown for the first time in the Galerie J., in 1965. He then made the Artypo series, created by randomly gluing typographic proofs onto canvas, and in 1975 his first Plastiforme, where ripped posters were placed on a polyurethane support. 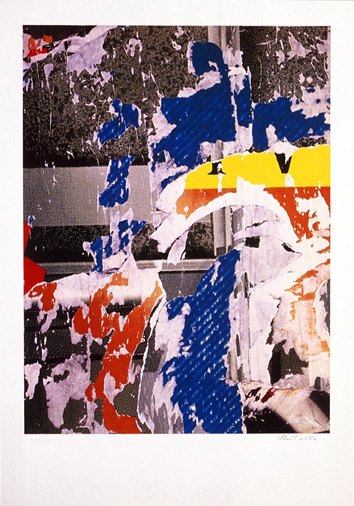 Rotella moved to Milan and created, in the 1980s, his blanks, covering the ripped posters with monochrome sheets of paper. In 1984 he began painting and produced the series Cinecittà 2, followed by the Sovrapitture, painting directly onto advertisements. He exhibited at the Centre Pompidou of Paris and at The Museum of Modern Art, New York, in 1990, and at the Solomon R. Guggenheim Museum in 1994. 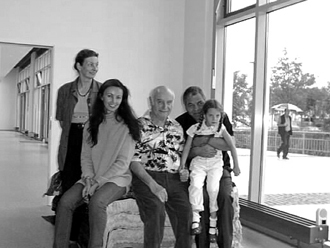 In 2000 the Foundation Mimmo Rotella opened; its aim is to promote contemporary art and to preserve the artist’s work. Mimmo Rotella died in Milan in 2006.